Dr. Wakely received his B.S. degree from Ohio State University and his M.D. from St. Louis University School of Medicine. He took residency training in Pediatrics at the Univeristy of Michigan Medical School, residency training in Anatomic Pathology at the University of Cincinnati College of Medicine, and a fellowship in Pathology and residency training in Laboratory Medicine at the Johns Hopkins University School of Medicine. He is currently Professor in the Department of Pathology at the Ohio State University Medical Center. 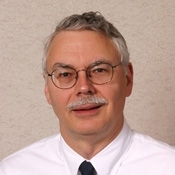 He is a member of numerous national pathology society committees, is an Associate Editor of the journal Cancer (Cancer Cytopathology) and serves on the editorial board of Annals of Diagnostic Pathology, American Journal of Clinical Pathology, and Human Pathology. He is a co-author of Pediatric Cytopathology, Chicago, ASCP Press, and has contibuted chapters to eleven text books on surgical pathology.